Tuna salad is a fan favorite easy snack (or lunch) option, but the classic mayonnaise-laden version isn’t always the most nutritious. By subbing mayonnaise for ripe and creamy avocado and adding chopped fresh cilantro, this tuna salad is rich and flavorful without being too heavy. In a small bowl, combine the tuna, avocado, lemon juice, red onion, chopped cilantro, and red pepper flakes. Mix with a fork until roughly combined. Serve tuna salad atop brown rice cakes. Sprinkle with fresh cilantro and a few dashes of hot sauce for a kick. Finding the perfect avocado is notoriously tricky, especially when you need it ripe right away. A great substitute for fresh avocado is pre-made guacamole that you can purchase at any grocery store. Not only is it convenient, but by substituting prepared guacamole for the avocado, you won’t be as tied to a meal plan if you don’t want to make the tuna salad right when your avocado is perfectly ripe. When purchasing pre-made guacamole, look for kinds made with whole ingredients—all guacamole really needs is avocado, lemon or lime juice, salt, and sometimes onion and peppers. Canned salmon would work equally well in this recipe and salmon is also an excellent source of brain-boosting omega-3 fatty acids. As with tuna, choose varieties canned in water and either low sodium or without added salt. I also love to use sardines, which are a more sustainable, omega-3 rich fish. Try it—you might actually like it! 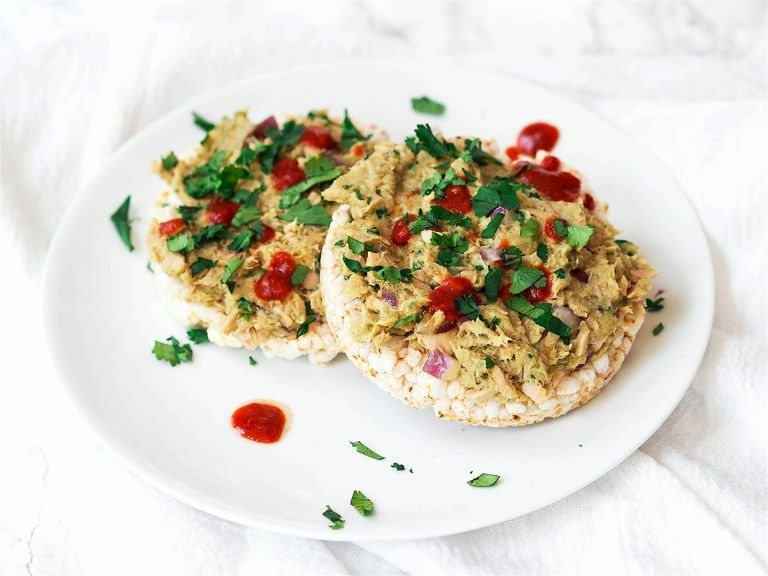 While brown rice cakes are a nice light base for this tuna salad, feel free to serve it atop whole grain crackers or toast, or even as a nutritious dip with crackers or raw vegetables. If you serve this for a party appetizer, or simply want to add more veggies to your day, try serving the tuna salad in “cucumber cups,” a super fun finger food. Peel one cucumber lengthwise but only peel off half the skin, using what I call the “clock” method. Imagine you’re looking down at the cucumber from one end—you’ll begin by peeling the length of the cucumber at twelve o’clock, skip one o’clock, peel another strip at two o’clock, skip three o’clock, and continue all the way around. Leaving some skin on not only helps your cucumber cup hold up well, but the remaining skin provides better grip when picking it up to eat. Due to oxidation, avocados are infamous for browning quickly after being cut. Since you’re only using ¼ of an avocado (or half of a half) in this recipe, one unique trick will help the remaining quarter stay fresh—a water bath! Place avocado half cut side down in a shallow dish with water just to the edge of the skin and store in refrigerator up to 24 hours.